Alpha1 release! Let me know what bugs you notice. Almost everything that is going to work on the M is enabled now, minus audio stuff (need more work on that). Some features won't ever work though. ie: Trap Focus - because the M doesn't send focus confirmation when in manual focus. - Fixed installer (thanks Alex), no more unsafe operations (ie: try to set bootflag while in live view). Warning: I'm not responsible for anything that might happen. This is an EXPERIMENTAL build. Please report bugs in this thread. ONLY donate for things we have done, not for things you expect! Didn´t know that there is a firmware update out already. Will this work on the 650D, too? Or is the firmware too different? I think it depends on the boot process maybe rather than on the firmware, a part from that, like you, I hope for it to work on other model too. The dump method we used should work on the 650D as well thanks A1ex! We now have a full firmware dump so I'm expecting by tonight (EST) we should be printing "Hello World!" From Roger Cicala's review: the EOS-M is "a firmware update and a price drop away from being a great camera". that's how it was idk. i didn't change the CONFIG_HELLO_WORLD code at all. BTW menu works and can be walked. Need to figure out how to work with the small amount of buttons we have (until later when we unlock how to use the touch screen). up/down/left/right can walk the menu, play/set either toggle a setting or open a sub menu. haven't enabled any features yet. What does REC do in photo mode? 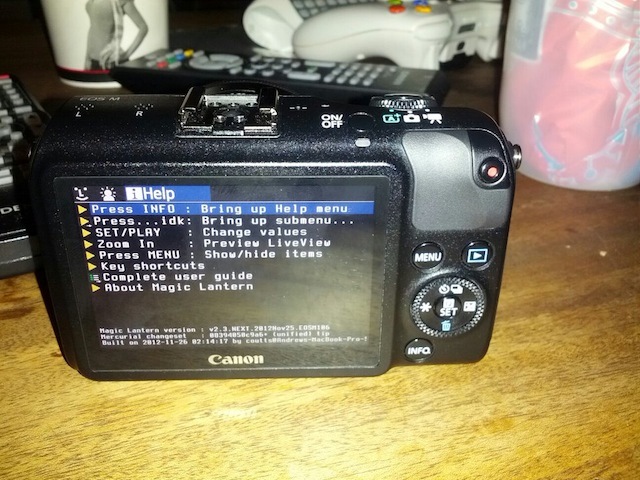 do allow other developpers working on the EOS M, why not adding a dump feature and providing a .FIR that enable the bootflag ? REC doesn't send an event to gui task unless in movie mode, I tried. I'm not sure how to implement long press but could be a good idea. the center button acts like Q in shooting mode / video mode, and set button in canon menu. I found the LV buffer addresses, so now ML graphics work (histogram and zebras for now to test). Congratulations to Coutts, and to all others who helped.